Famicase is an annual event held at Meteor, a retro game store in Japan, and I've been a participant since 2014. 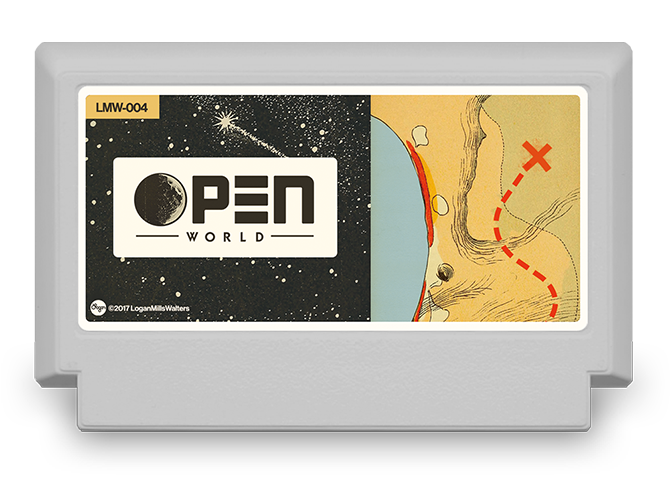 Artists from all over the world create labels for fake Famicom games, and I've now had the honor of being in the show twice. I was definitely playing a lot of Breath of the Wild while making 'Open World,' and I imagine the game is as close as an 8-bit one could be to it. 'Family Sandwich 87' is a dumb riff on annual franchise games like Pro Yakyuu Famista. 'Famicollector' is at least semi-autobiographical, as I've built up a modest collection of Famicom carts and Disk System games over the last couple years. And I'm not sure what kind of game 'SALARYMAN' would be; maybe a Legend of Zelda-style Action/RPG or something where you slowly level-up the corporate ladder. Also collaborated with some of the Detroit Arcade Club (which I co-founded) on another entry entitled 'Excite Nightmare 2.' This was the result of a late night Exquisite Corpse followed by some Photoshop rescue work the next day. Also featured in the 2015 show.